If Iqaluit is the gateway to Baffin Island, Rankin Inlet is the gateway to Nunavut’s central region known here as The Kivalliq. Nunavut actually has three regions: eastern Baffin Island, central Kivalliq and western Kitikmeot. 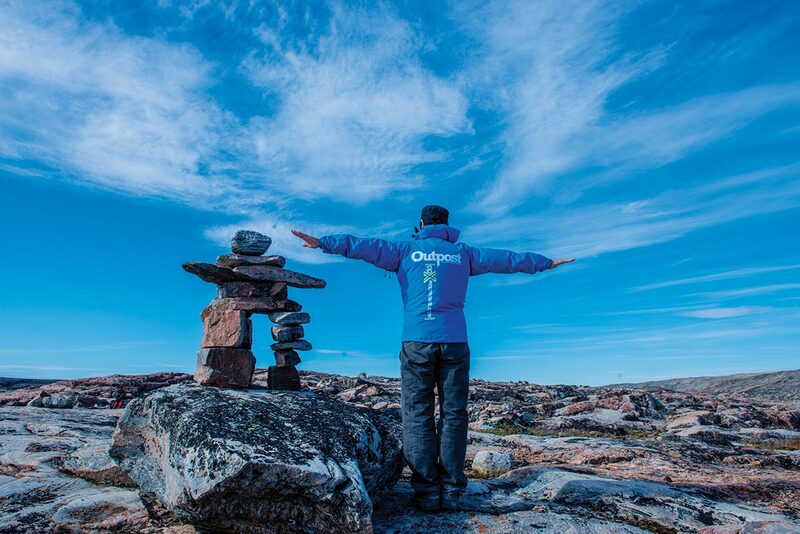 First Air flies from Iqaluit to Rankin Inlet several times a week, but from the south most people opt to go via Winnipeg, which is what Team Outpost Kivalliq chose to do. Dodging the whirling ATVs, we next stroll to the famed Matchbox Gallery. 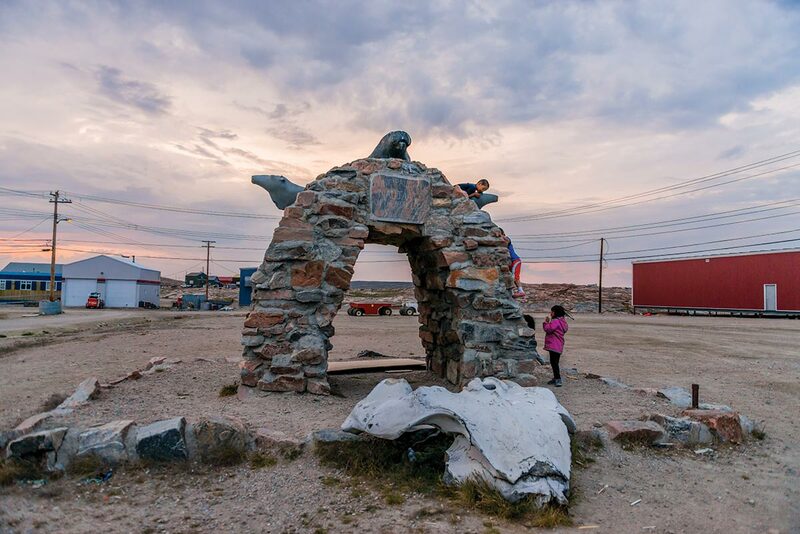 Renowned throughout the art world and in operation for 27 years, the modest-looking building is not just a gallery of amazingly-crafted Inuit art, but more a community centre and workshop space for artists, sculptors, printmakers and any kind of craftsman. The walls are lined with soapstone carvings, ceramic sculptures, bone carvings, paintings and jewellery. It’s an open space, and we’re in awe of the superb quality on display. The contrast between the incredible art and the casual and communal atmosphere is almost the most exquisite part of the experience, and we’re invited to chat with the working artists as we stroll around. Instruction is a big part of Matchbox’s mission and the centre works hard to encourage budding artists. We are torn between a desire to return to Rankin Inlet with a bag full of chisels to become master carvers ourselves… and the feeling that we’d be better suited as patrons! Ancient Inuit culture is everywhere in The Kivalliq. Pierre Aupilardjuk, an artist at the gallery who also teaches there, shows us some impressive pieces, including his own, and tells us the gallery has a world-renowned ceramics program—most of the ceramics on display are handcrafted, he says, not spun or moulded, and have a marbling/mottled look achieved by placing the piece in a sawdust fire overnight. As we stroll around Rankin, Arnaujuq (who calls herself A.A. for short and will guide us around The Kivalliq) asks us if we’ve ever heard of Marble Island. None of us knew of it. Like so much in the North, Marble Island is wrapped in legend and lore. “A long time ago,” A.A. explains, “a whaling boat became shipwrecked nearby, and all the crew who made it to shore later died. It is said that the first time you visit, you must crawl ashore on your hands and knees as a sign of respect to those who struggled years ago.” Otherwise, she adds, bad things will happen. We want to say yes, but before we can our knees protest the detour and force us to instead head out of town for some trekking in Iqalugaarjuup Nunanga Territorial Park. A month ago, about 10,000 caribou traipsed through here, Lesli adds, as we gaze out over the endless tundra. The next day we fly approximately 480 kilometres northeast to Repulse Bay, right on the shores of Hudson Bay and smack dab on the Arctic Circle. No sooner had Team Outpost landed than we were surrounded by the smiling faces of local children. Clearly, news of our celebrity status had reached The Kivalliq—until we learn the kids think we are their new teachers! It is late in the day and the sun was dropping behind the horizon, casting an orange glow over the community. Guide and local Bill Kennedy. Local outdoorsman, school teacher, volunteer firefighter and Justice of the Peace Bill Kennedy was to be our host and guide in Repulse Bay—called Naujaat in Inuktitut, which translates to “seagulls’ nesting place.” Inuktitut place names are always very descriptive, and the enormous seagulls that dip over our heads suggest they’d got this one right. Bill takes us down to the shoreline to breathe in the unparallelled fresh salt air. 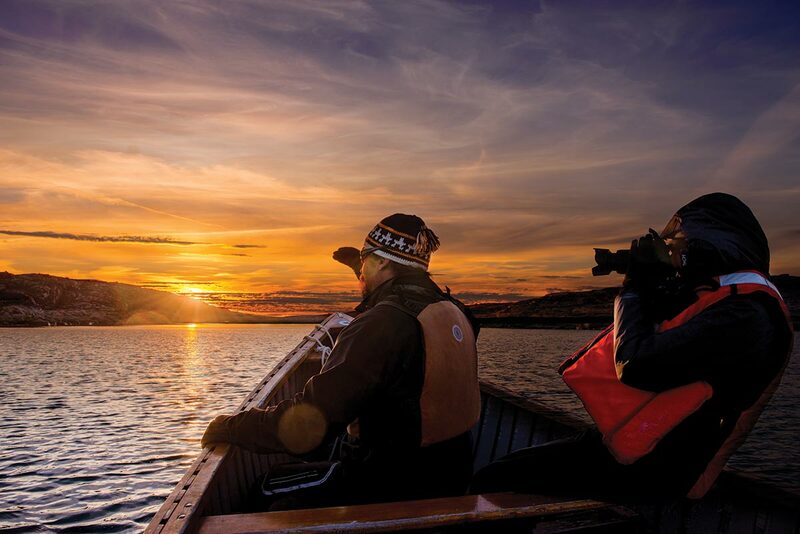 Hunting and fishing are still an integral part of life across Nunavut. These aren’t done for sport; they’re done for food, tools, clothing, crafts and tradition. The hunting of most species like polar bears, beluga, narwhal and bowhead whales is strictly limited, but in Repulse there are abundant populations of caribou, seals and Arctic char. The caught narwhal, we learn, will be shared by the whole community. Bill’s Arctic Circle Paws & Paddles Outfitters and Bed & Breakfast was our home in Repulse, and that night his sled dogs serenade us to sleep. There are nine dogs on his team, and the next day we happily help harness them for a bit of exercise. Since there’s no snow this time of year, we attach the team to a cart instead of a sled, and are soon careening down the gravel roads. The dogs live to run and are in their element, taking us off toward the great lying tundra. 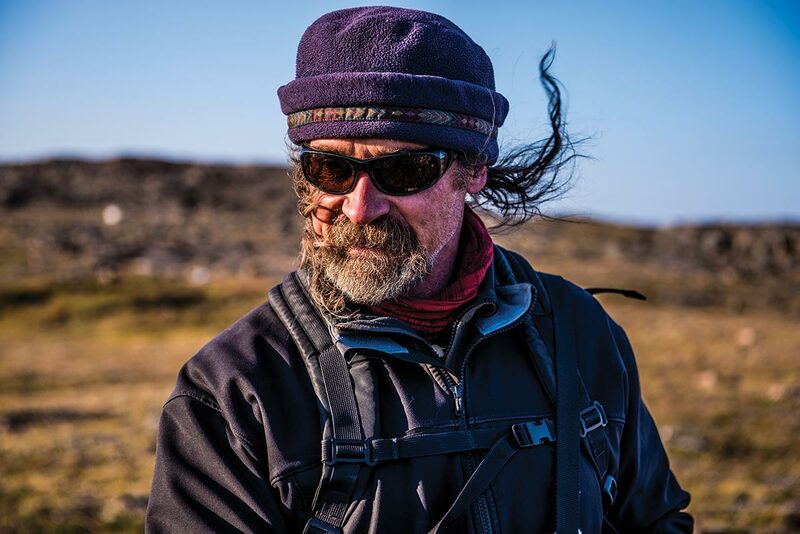 Our itinerary called for some Team Outpost Arctic Ocean kayaking, but strong winds and high waves leave us land bound. The conditions don’t stop Bill though, and moments later we are on his ATV, heading out of town toward some oddly abstract shapes on the horizon. Bowhead whales are only found in the Arctic and subarctic, and being second only to blue whales in weight, these mighty mammals were popular with 19th-century whalers. Bill is taking us to see some whale skeletons set back from the water’s edge, and as we wander around we are awe-struck by their size. “Bowheads have the biggest mouths of any whale,” he explains, as diminutive Team Outpost stands alongside some mighty bowhead jaw bones, feeling unmistakably the way krill likely do as they float around the ocean. The land around Repulse is as ageless as the weather, and as Bill leads us to a spot beneath a hill and out of the wind, we can’t help but reflect if the ancient Thule people who inhabited this land stood on this very spot a thousand years earlier. The trekking here is superb. Gentle hills, rocky outcrops, summer ice, spongy tundra, and the freshest air and most spectacular scenery imaginable. Eventually, we reach the Arctic Circle. There is no gift shop here, or anyone selling tea towels; we decide to mark the occasion not by hoisting an Outpost flag but by building that most iconic of Inuit structures: the Inukshuk. Anyone who has travelled anywhere in Canada’s North will have seen them. For that matter, anyone who has travelled anywhere in Canada will have seen them. They tend to appear along highways and in front yards but are most ubiquitous in the North. Quickly we begin to assemble our materials—all our lives we’ve selected the perfect skipping stones on beaches the world over; turns out, gathering ones for our Inukshuk takes considerably more effort. But we finish it and now it’s there. And we know we haven’t really marked our spot on Nunavut’s tundra, the tundra has marked us. On our final day in Repulse the winds are calm and we sprint down to the Arctic Ocean with our kayaks. Sporting dry suits and life jackets, we push off and move silently through the icy waters, revelling at the beauty of land, sea and sky. The intersection is incredible. Yet just when we begin to hit our stride the winds return with unexpected ferocity, as if to remind us who is boss on open ocean; we are forced to head for shore, but not before taking a wee dip in the cool Arctic water. It is invigorating! Later, Bill arranges for us to head to Harbour Islands in search of narwhal, bowhead, orca and polar bears, which are not uncommon along these shorelines. After an hour, our captain Paul circles a small island, and we step ashore and climb a nearby hill. Down the far side, at the centre of the island, is a verdant pond-filled valley speckled with wild flowers. We watch the sun begin its achingly slow descent, and gaze out across the bay, dotted with islands, spectacularly unspoiled. A part of Team Outpost would forever remain on that island, in Repulse and Rankin Inlet—indeed, in all of The Kivalliq. This article originally appeared as part of our opXpeditions Nunavut feature in Outpost Magazine’s 2014 Global Travel Guide.